In 2017 General Chapter Statement and Decisions on Healthy Community Living (C) no.35 states: Good community requires the adequate training of local superiors. a. In conjunction with the general administration, units shall provide training for local superiors as spiritual leaders of communities, focusing on the skills necessary to coordinate community activities and to animate community meetings. In response the Provincial and Council assembled all Superiors of Local communities from all Sectors in the Province to Suva for a one week workshop. The workshop was facilitated by Fr Kevin Duffy sm on an insightful and formative commentary on Chapter V of the Constitution, GROWTH AND FIDELITY, a modern version, as it were, of Chapter 12 in Colin's Constitution, THE MEANS BY WHICH THE SOCIETY CAN KEEP GOING" or continue in existence. The participants were grateful and appreciative of the inputs and the group interactions and sharing of experiences. Acknowledged was the significant time in the History of Oceania where the Central and Local leadership are all Local Oceanians. However, it was not to reinvent the Society since it is already there, but requires CREATIVITY from local Oceanians. The local superiors returned to their own communities with renewed vigor, affirmation, and pledges, with the Help of the Holy Spirit and the Intercession of our Mother Mary, to be more creative in coordinating community activities and animating community meetings and ministries. A heartfelt gratitude to Fr Kevin Duffy sm for sharing his time, knowledge and wisdom to empower the local superiors and their communities. Vinaka Vakalevu. 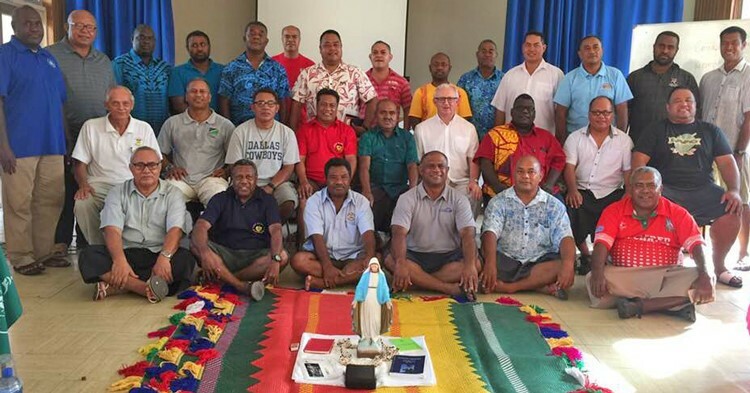 Front Row L-R: Fr Suni Halapio (Finetomai, Wallis), Bro Leonard Hivirkon (Paray, Vanuatu), Fr Steven Posirou (Tanagai, Solomon), Fr Leronio Vodivodi (Sector House, Fiji), Fr Setefano Mataele (Provincial), Fr Mirio Vakasirovoka (Wairiki, Fiji). Second Row (L-R): Fr Lewis Henry (Ashram, Fiji), Fr Valu Siua (Dala, Solomon), Fr Lutoviko Manu (St Martin, Solomon), Fr Vaioleti Tui'one (Kanosia, PNG), Lasaqa Emiliano (Nadi, Fiji), Fr Kevin Duffy (Facilitator), Fr Justin Ratsi (Hohola, PNG & Councilor), Fr Sipiliano Faka'osi (Chanel College, Samoa), Fr Mikaele Tuimavave (Lepea, Samoa). Not able to attend: Fr Antoine Tamaraka (Tanna, Vanuatu).